Welcome to Rice University’s Chapter of the National Society of Black Engineers (NSBE). 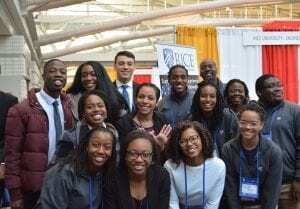 With more than 30,000 members, NSBE is one of the largest student-run organizations in the country. Rice University’s NSBE Chapter is dedicated to the realization of a better tomorrow through the development of programs and community outreach events intended to increase the recruitment, retention, and successful graduation of minorities in engineering. Our MISSION is to increase the number of culturally responsible black engineers who excel academically, succeed professionally, and positively impact the community. You don’t have to be black or an engineer to be a member of NSBE; you only need to be committed to its mission and work to fulfill it. Browse our website to learn more about our chapter at Rice University, the events we host, and how you can get involved.